The exhibition was launched today at Fort St Elmo in Valletta and will remain open to the public until the 9th December 2018. This Autumn, 10 Maltese heritage sites are hosting Valletta 2018’s closing multi-site exhibition, featuring 11 world famous local and international artists, making this one the largest exhibitions on the Valletta 2018 European Capital of Culture Programme to date. Titled Constellation Malta, the exhibition is curated by Rosa Martínez, who was also the first female director of the prestigious Venice Biennale. As the name suggests, Constellation Malta takes the shape of a constellation across the Maltese Islands, bringing installations, performances and site-specific interventions to prominent heritage sites, community venues, and public spaces across Malta and Gozo. The exhibition features various artistic media, including painting, sculpture, embroidery, photography, video, light and sound installations and performance art. These different artforms will be exhibited across 8 sites in Malta and 2 in Gozo: Fort St Elmo, the Church of St Mary Magdalene and the National Museum of Archaeology in Valletta, Tarxien Temples, Ħaġar Qim and Mnajdra Visitor Centre in Qrendi, the crypt at St Catherine’s Parish Church in Żejtun, The Arches in Senglea, the National Museum of Natural History in Mdina, Ġgantija Visitor Centre and Ta’ Kola Windmill in Xagħra, Gozo. The list of world famous artists in the contemporary art industry, includes Marina Abramović, Chiharu Shiota, Forensic Oceanography and Architecture, Kyung-Jin Cho, Austin Camilleri, Yoshitomo Nara, Saskia Calderón, Eulalia Valldosera, and Tania Berta Judith. The exhibition also sees the participation of the Malta Fancy Poultry and Pigeon Club as well as a collection of anonymous photographs portraying ‘readymades’ in Malta. The series of artistic interventions in Constellation Malta is designed to create fruitful dialogues between historical sites, popular culture and contemporary art. It invites the public to engage with contemporary art within a historical setting, bringing the two together to create a unique narrative. Minister for Justice, Culture and Local Government Owen Bonnici said “we are committed to keep on nurturing the culture sector. Through Constellation Malta, we are bringing culture closer to the community, especially due to the fact that it is taking place around a number of historical sites around our islands, including Ħaġar Qim and Ġgantija. 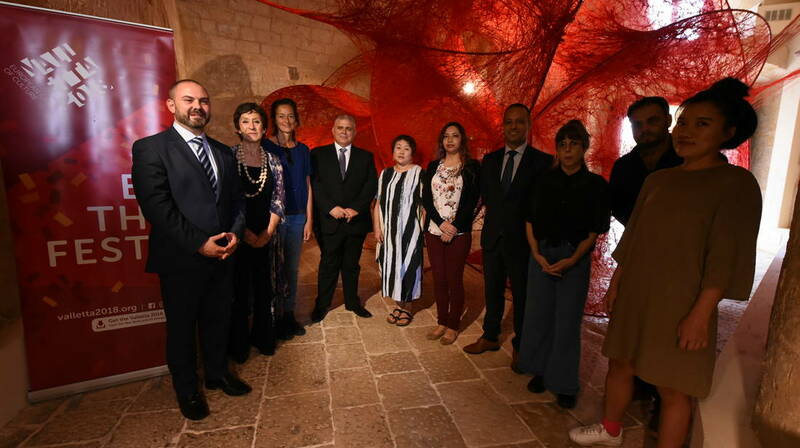 This exhibition brings together our culture and history together with local and international contemporary art, and will provide an opportunity to its visitors to view our local Maltese heritage through a new artistic lens”. Valletta 2018 Foundation Chairman Jason Micallef said “this is the largest exhibition Valletta 2018 has held to date. Through this exhibition, we will encourage the Maltese and Gozitan public to visit the islands’ beautiful heritage sites where they can view some of the best local and international artworks. In this way, one can truly experience the spirit of this exhibition, that of nurturing a dialogue between historical sites, popular culture and contemporary art “. Heritage Malta Chairman Dr Anton Refalo pointed out that this is yet another project wherein Heritage Malta is collaborating with other entities. It reinforces the idea of accessibility which is one of the main pillars of the Agency. The concept of this exhibition is interesting since two completely different narratives, Contemporary Art and the Cultural heritage world, are in constant dialogue. It is also representative of the nomenclatures that are being celebrating throughout this year: Valletta 2018 and the European Year of Cultural Heritage. Curator Rosa Martinez said “the exhibition associates the term ‘constellation’ with Malta, lending certain locations in the Maltese archipelago metaphorical weight. The sites become meaningful stars… by unveiling the meaning embodied in these new ‘stars’, visitors and passers by become voyagers, empowered to undertake their own unique journeys towards understanding and interpretation”. Tickets may be bought from www.heritagemalta.org or from the Heritage Malta sites which form part of this exhibition. A €20 ticket grants exhibition-goers one-time access to each of the Heritage sites hosting this exhibition sites, and may be used throughout the whole exhibition period, between the 13th October and 9th December 2018. All artworks exhibited in community venues and public spaces can be viewed free of charge. The online catalogue for Constellation Malta is available at: https://universes.art/en/specials/constellation-malta/. For the opening hours of Heritage Malta sites visit www.heritagemalta.org.